Geography and history is what attracts people to Flores. The town rests on the island that was the location of the last independent Mayan City State of Tayasal. The kingdom of Tayasal held out until 1697, when the Spanish conquered the island by using boats. The modern city of Flores was built on top of these ruins.The city itself is a nice colonial place to visit although most people just stop here on their way to Tikal. It is worth spending a day or two here on your way to Tikal. The island town of Flores is located in the center of Lake Peten Itza in Peten, the northern area of Guatemala. Flores as a town istelf is small. The island town is accessible by a 750 metre causeway connecting nearby Santa Elena. Tikal is the main reason why people come to Flores. This is the largest Mayan city discovered and one of the largest cities ever built in the pre-industrial world. Lake Peten Itza, the stunning lake the city of Flores is surrounded by, is a great place for a quiet boat ride. Pleasure rides to visit a mirador (lookout) and the small mayan ruins on the opposite side of the lake are accessible for an entrance cost of US$5. You can find boats and eager-to-please boatmen on the eastern side of the causeway as you enter Flores. Jungle Trekking is easy to experience in the Guatemalan jungle at Skyway Ixapanpajul, a private nature reserve just 12 kilometres from Flores. You can take a 3km stroll across 6 tree top suspension bridges, zip-line through the canopy, horse-ride or take a night safari. Mundo Maya International Airport (FRS) is also known as Flores International Airport. This is a small airport mainly servicing tourist that want to experience Tikal. The airport is located approximately 3 kilometres to the east of Flores, a US$2 taxi ride or 10 minutes on one of the local buses. The airport is currently undergoing expansion in order to handle more passengers. Currently most flights are to Guatemala City, Cancun and Belize City and are serviced by TACA or Transportes Aereos Guatemaltecos(TAG). Although there are a few flights to Houston serviced by Continental Express, Puerto Barrios serviced by Inter-Taca, Mérida serviced by Aviateca and San Salvador serviced by Inter-Taca. Main access by road to Flores/Santa Elena is via Rio Dulce. To arrive at Flores by bus, travellers will generally need to buy a ticket to the final destination of Santa Elena. The new bus station in Santa Elena is only 2 blocks from the causeway bridge to Flores and is the arrival point for most long distance buses. Currently, Linea Dorado is the only company running buses that travel over the 750m causeway, termating in Flores. Direct Buses are available from Guatemala City, Puerto Barios and Chiquimula. Buses from Coban or Belize are also available. Schedules can be found at thebusschedule.com. It is possible to arrange direct transport to Mexico into Palenque. Many travel agencies arrange the trip and make it pretty hassle free. Remember if you take local transport it will be a series of collectivos to a river, then a ferry. The immigration offices are not on the border, have limited hours and be hard to find. If you do not go to the immigration office it is a big fine and lot of paperwork later on the Mexican side. Lastly the collectivos on the Mexican side do not operate late at night. With at total geographical size of less than 2km2, the island of Flores is small enough to walk the entire city by foot in under an hour. Tuk-Tuk taxis are readily available throughout Flores. None of these are metered however, so be sure you negotiate the fare before setting out or you might be in for a nasty surprise. Drivers are familiar with tourists and won´t hesitate to try and charge you tourist prices; a friendly but firm instance on a fair price will usually suffice. Ask at your hotel or hostel for the expected fare to your desitination. Being such a small town (less than 10 blocks), Flores doesn't have the usual buses and trains to get around. The nearest bus stations are located across the bridge in the town of Santa Elena. Use the bus stations in Santa Elena to catch a bus to nearby attractions. Decent mountain bikes are available for rent from Backabush Bike Tours on Av Barrios. As at August 2009, these were US$2.00 per hour. Cafe Arqueológico Yax-ha, Avenida de 15 Septiembre. Offers a variety of Guatemalan, international and pre-Hispanic dishes. After having placed your order, you can have a look at the library with lots of books about the Mayan culture. There is photo exhibition of new and ancient pictures of various archaeological sites. La Luna, Calle 30 de Junio. Owned by a Spanish man and his German wife, this is one of the premier places to eat on Flores. In the high season (especially Easter and Christmas) it is advisable to reserve a table in advance. Try pimientos rellenos (stuffed peppers), suprema de pollo (chicken), puyaso (steak) en salsa de crema y pimienta negra, or the vegetarian calebacitas (stuffed pumpkins). For a European flair try the Cordon Blue. For dessert, vanilla ice-cream with moras calientes (a relative of the raspberry) is highly recommended. Main dishes Q40-90. Las Puertas, corner of Avenida Santa Ana and Calle Central. This is a great place for breakfast and lunch. It is run by Cristina, a Chilean known for her support of local wildlife and her organic, safe food. Try the panone with homemade bread and choice of chicken, ham, cheese, steak or vegetarian fare. The chicken in cream sauce and the Pasta "Survivor" make this every rich local's favorite restaurant. The restaurant also serves a variety of licuados (fruit smoothies) of which you should definitely have the strawberry (with water instead of milk). She also offers wild honey harvested from the Tikal jungle and natural "chicle" chewing gum, harvested by Mayan farmers still today. This is a pleasant place to relax with a drink in the evening - in addition to the usual selection of cocktails, licuado with rum is also available. Films are shown at 4PM and 7PM and there are also live music sessions. It is highly recommended. Cool Beans / El Cafe Chilero, near the causeway by the Flores bus stop. Gets great reports for its coffee, baked goods (including brown bread) and filling breakfasts. Open daily at 6AM, breakfast for around Q15. Mayan Princess, Avenida Reforma. noon-10:30PM. Shows films at 4PM and 8PM. Main dishes Q40, drinks Q10-20. El Tucán, Calle Centro América. This restaurant is named after a tame toucan that lived on the premises and that had a habit of stealing the guests vegetables, although the place lost some of its charm when the toucan flew away in the spring of 2004. The restaurant serves Mexican food and illegally hunted wild game. El Zotz, Calle 15 de Septiembre. A typical breakfast and lunch restaurant. La Albahaca, Calle 30 de Junio, ☎ +502 78675449. 6PM. Serves homemade pasta, chocolate mousse and tiramisu, crusty homemade bread and garlic butter, delicious salads, Certified Angus beef, fish and shrimp. Delicious smoothies. Prices quite reasonable. Restaurant Mirador del Lago. Located on the square, it serves good, inexpensive food. Restaurante Capitan Tortuga, Calle 30 de Junio (Flores, Peten), ☎ +502 78675089. 11:00 to 22 Hours. Good food for a good price. Guatemalan and international food, fish of the lake, pizza & pastas, Nice place to sit outside and watch the sunset. Has room for big groups. Special menu for groups. Q45 for chicken burritos. Happy Hour from 16:00 to 18:00 hours. Ice creams with lake view. El Trópico, Calle Sur (On the street facing the bridge). This bar is equally popular with locals and tourists. Good music and typical drinks like Cuba Libre, Gallo. Las Raices. A lake side restaurant near the municipal dock. Cool Vibes (In San Benito). Has a dance floor and a good selection of music. Cool Beans. Cool Beans is a great little cafe in Flores. They have good coffee and great frozen drinks as well. US$1.50. Chaltunha Hostel. A new hostel, three minutes by boat from Flores. Beautiful sunsets over the water. Casazul, Calle Fraternidad, ☎ +502 7926-1138, +502 7926-3360, e-mail: reservaciones@corpetur.com. Spacious rooms with TV, fan, noisy AC and refrigerator - great view of lake. US$41/48/60 for single/double/triple room in high season. Hospedaje Doña Goya, Calle la Union, ☎ +502 7926-3538. Q100/80 for a double with private/shared bath, Q25 for a bed in the dormitory. Hospedaje Doña Goya II. Next door to Doña Goya, but a little roomier, with a friendly atmosphere and good breakfasts. Roof top hammocks with a nice view of the lake are available. Hotel Isla de Flores, Avenida la Reforma, Ciudad Flores Petén, ☎ +502 7867 5176, e-mail: hotelisladeflores@gmail.com. Hotel la Casona de la Isla, Calle 30 de Junio, ☎ +502 7926-0593, e-mail: reservaciones@corpetur.com. Restaurant, pool, A/C. US$36/43/53 for single/double/triple room. Los Amigos, Calle Central, ☎ +502 5716-7702, fax: +502 5584-8725. A hostel in the center of Flores that's popular with travelers. European owned with a restaurant, cheap Happy Hour, internet access and a book exchange. Skip the boxed lunch for Tikal, unless you like soggy white bread and processed cheese. Using the door to get in can be tricky. Just ring the door bell and out of nowhere you will hear this bird chime. This is their 'door bell'. Someone will soon open the door for you by pulling a rope from the ceiling. If you want to get out, find the tweety bird hanging from a rope in the lobby and pull it, that should open it. Don't use their travel services (especially for shuttles) or trust their travel information on the website. Will sell you first-class seats on Linea Dorado and put you in second-class seats on a lesser bus line. Q70 for a dorm bed, Q170 for a private room. Hotel Mirador del Lago, Calle 15 de Septembre, ☎ +502 7926-3276. 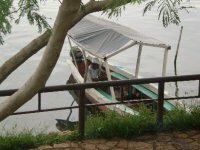 30 clean rooms with hot water and fan - some also have views of Peten Itza lake. There is a travel agency across the street that arrange local trips and tours. They have an internet cafe in the lobby, and laundry machines, both can be paid for at the front desk. Dorm Q25, double room Q70 some with lake view. Hotel Petén, Calle 30 de Junio, ☎ +502 7926-0692, e-mail: reservaciones@corpetur.com. Comfortable rooms, some with a nice view to the west over the lake, TV and a jug of filtered water. US$35/43/52 for single/double/triple room. Hotel Santana, Calle 30 de Junio, ☎ +502 7926-0662. Request room with balcony and view of the lake. US$31/40/55 for single/double/triple room. Hotel Villa Maya, 10 km outside of Flores, on the way to Tikal. A quiet place by Laguna Petenchel with a pool, restaurant, and kayak and bike rentals. There are crocodiles in the laguna, so bathing is safest in the pool. There are various paths in the area, from a 10-minute stroll on the premises to one hour around the laguna. This hotel is a little expensive, but worth the extra cost. Hotel Casa Amelia, Union Street, ☎ +502 7867-5429, e-mail: reservaciones@hotelcasamelia.com. Check-in: 3PM, check-out: 1PM. Small hotel near the airport with A/C, TV, private bathrooms, internet, and a view of the lake. US$25/$40/$60. Petén Esplendido, very near the causeway to Flores. Expensive (and not worth the price). There is only one ATM in the town of Flores. This ATM is a free standing cash machine and is not afilliated or attached to any bank. There are no banks within the town of Flores, however several major banks have branches located a short 15-20 minute walk across the bridge to the town of Santa Elena. This is version 44. Last edited at 8:44 on Sep 25, 18 by Utrecht. 11 articles link to this page.